What was it that Taylor Swift once said? Haters gonna hate hate hate hate hate? One can not simply ignore how exciting the anticipation could be for a feature film to finally feature both iconic superheroes Batman and Superman. Judging from the relatively lackluster marketing campaign and the somewhat *shrug* reception of 2013's “Man of Steel” you can't really call “Batman v Superman: Dawn of Justice” a disappointment. After all the backlash after Ben Affleck was cast as Batman which got me excited because of ya know, his recent filmography hasn't been ya know terrible: "The Town," "Gone Girl," oh and Best Picture winner "Argo." So it is with mild expectations I went into this battle royale of comic book movie event films and not surprisingly I was met with mild results. The film is a far cry from the bottom-of-the-barrel comic book offerings. This isn't “Batman & Robin” of course. But it't not top tier stuff either: it's simply middle of the road entertainment, plays things safe, even if it offers some plot developments that sort of surprised me (since I haven't read these comics). It must be noted that the film's run-time is long. Yes, too long. A lot of stuff is crammed into those 151 minutes. Too much stuff I'd say. There are lots of characters introduced, most rather well, though not much too interesting happens to them as the film progresses. I had high hopes when I heard Oscar winning “Argo” screenwriter Chris Terrio was involved (along with perennial comic book film screenwriter David S. Goyer). He injects the film with a needed boost of oomph and I enjoyed some of the twists the story took but overall this feels a little too self serious and lacks any sort of humor or comic relief. The movie doesn't really feel “fun” and lacks a rooting factor that was so present in the Christopher Nolan Batman films (and yet we all know how that trilogy was the Kocoum of superhero films). It must be said that one of the strengths of the film is actually in its casting. Have there ever been so many Oscar nominated and winning thespians in a superhero film? (For the record, I counted seven). Say what you want about Ben Affleck. Go ahead, even call him Batfleck if you want. The guy is actually a really good Bruce Wayne/Batman. And even though we've seen Batman (and his “origin”) a million times on screen, they certainly do something different with the character. Everyone knows Wonder Woman shows up here as well and she's pretty awesome. I also think Henry Cavill, even if he's not exactly Mr. Personality makes a fine Man of Steel. Jesse Eisenberg hams it up as Lex Lurthor (whose character and motivations I never really understood). 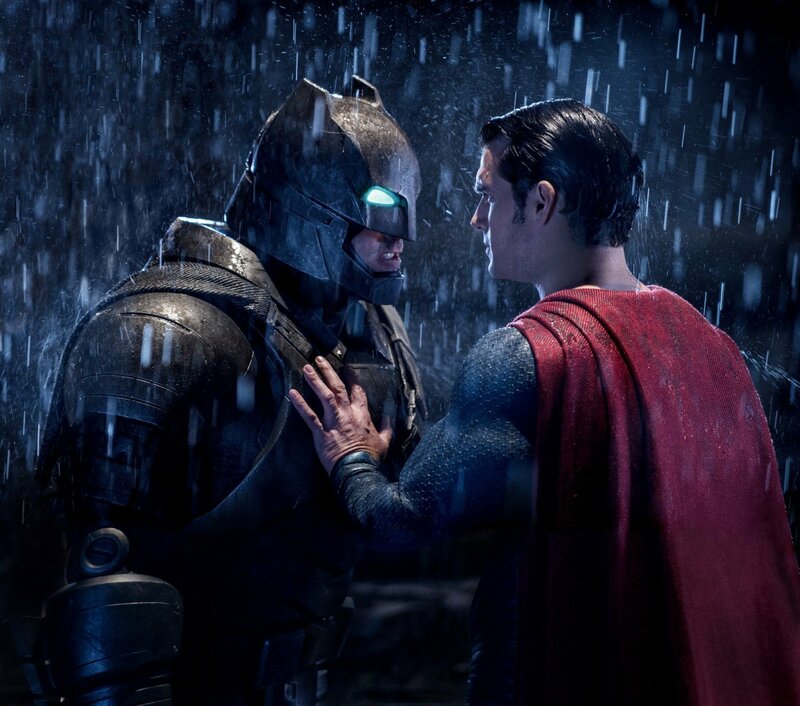 The writers even attempt to concoct a decent reason why Batman and Superman would be fighting in the first place. You remember the end of “Man of Steel” when Superman managed to damage half of Metropolis and probably kill thousands of people while fighting Zod? That has something to do with it. I would have liked to see more of Superman actually being Superman and saving people. And what about that internal struggle for Clark Kent to constantly deal with being in two places at once? Director Zack Snyder, who sort of feels like a Michael Bay wannabe, is much more interested in the spectacle though he actually sort of tones down his questionable desaturated color palette. Yes the film is practically nonstop bombastic and unmemorable action. And that's too bad because having Batman and Superman in the same movie feels like such a big deal, but the movie doesn't quite capture awesomeness of that idea. Though it must be said that I was genuinely surprised the cajones involved with the final act development that I didn't see coming because, like I said, I have never read any Superman comics especially the one that influenced the film's ending. I kind of admired it.